Relics in the Church have always received particular veneration and attention because the body of the Blesseds and of the Saints, destined for the resurrection, has been on earth the living temple of the Holy Spirit and the instrument of their holiness, recognized by the Apostolic See through beatification and canonization. The relics of the Blesseds and of the Saints may not be displayed for the veneration of the faithful without a proper certificate of the ecclesiastical authority who guarantees their authenticity. The present Instruction substitutes the Appendix of the Instruction Sanctorum Mater and is directed to diocesan Bishops, Eparchs and those who are equivalent to them in law, as well as to those who participate in the procedures regarding the relics of Blesseds and Saints and the mortal remains of Servants of God and Venerables, in order to facilitate the application of what is required in such a particular matter. § 1. Before undertaking any operation on relics or on mortal remains all that is prescribed by local civil law must be observed and, in conformity with such law, the consent of the heir must be obtained. § 2. Before the beatification of a Venerable Servant of God, the heir is to be invited by the competent Bishop to donate the mortal remains to the Church by means of an instrument that is juridically recognized by civil and ecclesiastical authorities, so that their preservation may be safeguarded. § 1. The competent Bishop is to send to the Prefect of the Congregation for the Causes of the Saints the written request with which he asks the consent of the Dicastery for the procedures which he intends to perform. § 2. In this request the Bishop is to specify the exact place where the relics or the mortal remains are preserved (city, name of the church, chapel, public or private cemetery, etc.) and to confirm that the prescription of Art. 2 § 1 of the present Instruction has already been fulfilled. § 1. If the Bishop intends to perform the translation (that is, the permanent transfer) within the confines of the same diocese or eparchy, he is to specify to the Congregation the place of the new location of the relics or of the mortal remains (city, name of the church, chapel, public or private cemetery, etc. ), and include the project. § 2. In the case of translation to another diocese or eparchy, the Bishop is to send to the Congregation, together with the project of the new location of the relics or of the mortal remains (city, name of the church, chapel, public or private cemetery, etc. ), the written consent of the Bishop who will receive them. § 1. If the relics or the mortal remains are to be alienated (that is, permanent transfer of ownership) within the confines of the same diocese or eparchy, the competent Bishop, together with the request mentioned in Art. 3 § 1 of the present Instruction, is to send to the Congregation a copy of the written consent of the alienating party and of the future owner. § 2. If the relics or the mortal remains are to be alienated to another diocese or eparchy, the competent Bishop, together with the request mentioned in Art. 3 § 1 of the present Instruction, is to send to the Congregation a copy of the written consent of the Bishop who will receive them, the written consent of the alienating party and of the future owner, as well as the project of the new location. § 3. For the alienation of significant relics, icons and precious images of the Oriental Churches both the Congregation for the Causes of the Saints and the Patriarch with the consent of the permanent Synod are competent. § 4. If the relics of a Blessed or of a Saint are to be brought in pilgrimage (that is, temporarily transferred) in other dioceses or eparchies, the Bishop must obtain the written consent of each Bishop who will receive them and send a copy of the consent to the Congregation, together with the request mentioned in Art. 3 § 1 of the present Instruction. All those who take part in the procedures must first take an oath or promise to fulfill faithfully their task and to maintain the secret of office. § 1. On a day and at an hour specifically established, the Bishop or the Episcopal Delegate and all those mentioned in Artt. 8-11 of the present Instruction, are to go to the place where the relics or the mortal remains are preserved. § 2. If the Bishop or the Episcopal Delegate consider it opportune, other persons may also be present at the recognition. § 3. Publicity regarding the event is to be avoided in every way. § 1. Before removing the relics or the mortal remains from the place in which they are preserved, if there is an authentic document of the last burial, canonical recognition or translation, it is to be read aloud by the Notary so that it may be verified if what is written in the document coincides with that which is established at the present moment. § 2. 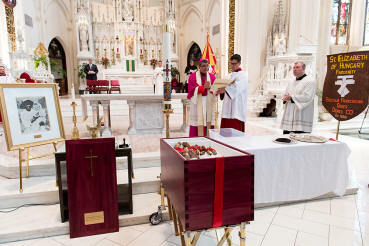 Whenever there is no authentic document or if the urn or the seals attached to it appear to be broken, every possible care is to be taken to assure that these are truly the relics of the Blessed or of the Saint or the mortal remains of the Servant of God or of the Venerable, who is being identified. § 1. When these procedures have been completed, the anatomical experts are to inspect carefully the relics of the Blessed or of the Saint or the mortal remains of the Servant of God or of the Venerable. § 2. Furthermore, they are to identify analytically all the parts of the body, to describe in a detailed manner their state, and they are to put their findings down in a Report signed by them and attached to the acts. § 1. After that which is necessary to provide for the preservation of the relics or of the mortal remains, and the body has been recomposed, everything is to be eventually placed in a new urn. § 2. If the relics or the mortal remains are dressed in new clothes, these, as much as is possible, are to be of the same style as the previous ones. § 3. The Bishop or the Episcopal Delegate is to take care that no one takes anything out of the urn or places something in it. § 4. If possible, the old urn and everything which was found in it are to be religiously preserved; otherwise they are to be destroyed. § 1. Whenever the canonization of a Blessed or the beatification of a Venerable Servant of God is imminent, or for other reasons justified in the request mentioned in Art. 3 § 1 of the present Instruction, one can proceed during a legitimate canonical recognition to the extraction of some little parts or fragments, which are already detached from the body, according to the indications of the anatomical expert. § 2. Such fragments are to be given by the Bishop or by the Episcopal Delegate to the Postulator or to the Vice Postulator of the Cause for the creation of relics. § 1. It is the right of the Postulator of the Cause to prepare and to sign the certificate of authenticity of the relics. § 2. In the absence of the Postulation, it is the right of the diocesan Bishop, of the Eparch, of the one equivalent to him in law, or of his Delegate, to prepare and to sign the certificate of authenticity of the relics. The commerce (that is, the exchange of a relic for something else or for money) and the sale of relics (that is, the cessation of ownership of a relic for a corresponding price), as well as their display in profane or unauthorized places, are absolutely prohibited. § 1. If the operation involves the translation of the mortal remains of a Servant of God or of a Venerable within the confines of the same diocese or eparchy, the urn is to be closed and bound with ribbons fixed with the seal of the Bishop and, without any solemnity, is to be put in the same place or in the new place of burial, avoiding every sign of unlawful cult according to the Decrees of Urban VIII on non-cult. § 2. Whenever the relics of a Blessed or of a Saint are involved, possible signs of public cult are permitted according to liturgical norms presently in force. § 1. If the relics or the mortal remains will be definitively transferred to another diocese or eparchy, after having observed the prescription mentioned in Art. 2 § 1 of the present Instruction, the Bishop of the diocese or eparchy where they are preserved is to nominate a member of the Christian Faithful (priest, consecrated man/woman, layman/laywoman) to act as Guardian-Porter. § 2. The Guardian-Porter is to accompany them to their definitive destination at the place established by the diocesan Bishop or Eparch who will receive the relics or the mortal remains, acting according to Art. 26 of the present Instruction. § 1. The Notary is to record all the procedures performed in properly prepared minutes, signed by the Bishop or Episcopal Delegate, by the Promoter of Justice, by the anatomical experts and by the two witnesses mentioned in Artt. 9-10 of the present Instruction, as well as by the Notary, who authenticates the acts with his signature and seal. § 2. The Rescript of the consent of the Congregation for the Causes of the Saints is to be attached to the minutes. § 1. The minutes of all the procedures performed, closed and stamped with the seal of the Bishop or of the Episcopal Delegate, are to be preserved in the diocesan or eparchial Chancery and a copy of the minutes is to be sent to the Congregation for the Causes of the Saints. § 2. Whenever photographs or the filming of the procedures performed are authorized, these are to be attached to the minutes and preserved, together with them, in the diocesan or eparchial Chancery. § 1. The relics of a Blessed or of a Saint can be carried in pilgrimage to different places within the confines of the same diocese or eparchy. In such a case, the competent Bishop is to appoint a Guardian-Porter who is to accompany the relics to the different places. § 2. For pilgrimages outside the diocese, the prescriptions of Artt. 5 § 4 and 32-38 of the present Instruction are to be observed. § 1. The competent Bishop can preside at the procedures personally or through a Priest who is his Delegate, nominated ad hoc. § 2. The Bishop or the Episcopal Delegate is to nominate a Notary and others responsible for the technical aspects of the work. § 1. After having observed all that is mentioned in Art. 2 § 1 of the present Instruction, and having obtained the Rescript of the consent of the Congregation, the Bishop or the Episcopal Delegate, the Notary and those charged with the technical aspects of the work are to go to the place in which the relics are preserved. § 2. If the Bishop or the Episcopal Delegate consider it opportune, other persons may also be present at the occasion. § 1. After having removed the urn, if there is an authentic document of the last canonical recognition or of the previous pilgrimage, it is to be read aloud by the Notary so that it may be verified that what is written in the document coincides with that which is established at the present moment. § 2. Whenever there is no authentic document of the burial, of the preceding canonical recognition or of the last pilgrimage, or if the urn or the required seals appear to be broken, every possible care is to be taken to be sure that these are truly the relics of the Blessed or of the Saint at hand. In regard to the cult of a Blessed during the pilgrimage of the relics, the prescriptions in force must be followed: “On the occasion of the pilgrimage of significant relics of a Blessed [...], the possibility of liturgical celebrations in his honor is granted by the Congregation for Divine Worship and the Discipline of the Sacraments, for the individual churches in which the relics are displayed for the veneration of the faithful and for the days on which they remain there. The request is presented by the one who organizes the pilgrimage”. § 1. When the pilgrimage is finished, the relics are to be returned to their original place. § 2. The minutes of all the procedures performed, drawn up by the Notary, closed and stamped with the seal of the Bishop or of the Episcopal Delegate, is to be preserved in the diocesan or eparchial Chancery and a copy of them is to be sent to the Congregation for the Causes of the Saints. “Saints are venerated in the Church, according to tradition, and their authentic relics and images are held in honor.” Ecumenical Council Vatican II, Constitution on the Sacred Liturgy Sacrosanctum Concilium, 4 December 1963, n. 111. Cf. AAS 99 (2007), 465-517. Cf. cann. 887 and 888 CCEO. Cf. can. 1190 § 1 CIC; can. 888 § 1 CCEO. For example, the following are prohibited: burial under an altar; images of the Servant of God or of the Venerable with rays of light or halo; their display on an altar; ex voto offerings at the tomb or images of the Servant of God or of the Venerable; etc.